Can Lovie Smith revitalize Illinois's recruiting? To fix Illinois, new head coach Lovie Smith must bring in better talent with recruiting. Here's why he could do so. A nine-year stint leading the Chicago Bears enabled Smith to keep close watch on the Fighting Illini. That stretch also offers the most compelling evidence that Smith, 57, can render the above question moot by breathing life into the program after decades of mediocrity. 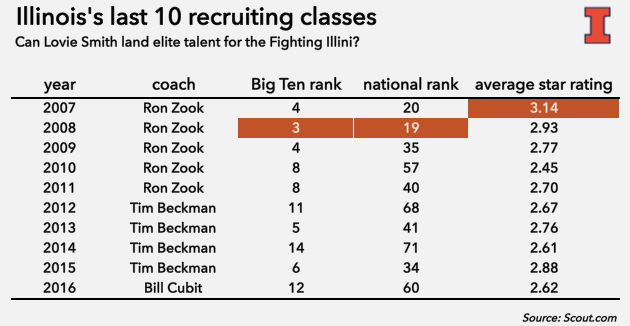 There’s just one problem: Illinois doesn’t have many good players. Smith’s ability to overcome that, more than anything else, will determine his level of success in Champaign. • NADKARNI: How have former NFL head coaches fared in college? The state of Illinois is not the most talent-rich in the Midwest (that distinction belongs to Ohio), but it does bear a decent amount of players suited to compete in one of the nation’s top conferences. A February 2015 ESPN article noted that the Land of Lincoln ranked 10th in production of FBS prospects from 2006 to ’14. The issue for the Illini is that they haven’t been able to attract enough of those recruits—some of whom wind up helping big-name Big Ten teams beat Illinois, while others leave the state to play in different leagues. Chicago is the nation’s third most populous city, according to a July 2014 U.S. estimate from the U.S. Census Bureau, but Illinois faces plenty of competition for recruits there. For example, take the class of 2016. Three recruits ranked in the Scout 300 hail from the Chicago area: four-star defensive end Josh King, four-star defensive tackle Naquan Jones and four-star linebacker Tuf Borland. Those three players signed with Michigan State, Michigan State and Ohio State, respectively. High-profile programs in the Big Ten such as Ohio State and Michigan frequently pull elite prospects from outside of their respective states thanks to their established brands and winning traditions. That’s a difficult proposition for Illinois, a program that has won more than eight games only twice since 1989. Meanwhile, the presence in the Midwest of four programs with the potential to compete for College Football Playoff berths every year (Michigan State, Notre Dame, Ohio State and Michigan) as well as several others with stronger recent track records means the Illini are often battling for second-tier prospects. Yet another obstacle Illinois must face in recruiting? Rigorous admissions standards. Put it all together, and it’s not difficult to see why the Illini have been unable to compile the talent necessary for sustained success. The chart below breaks down Illinois’s last 10 recruiting classes. Notice that the program’s highest class rankings came nearly a decade ago under former coach Ron Zook, who was renowned for pulling prospects out of Florida, such as Hialeah Senior High standout Corey Liuget, the No. 8 defensive end in the class of 2008, according to Scout.com. Smith hasn’t manned a college sideline since 1995, but there’s reason to believe he could bolster Illinois’s recruiting efforts. For one, his hire has changed the national perception of the program: Illinois is no longer the directionless bottom feeder led by a widely ridiculed coach (Tim Beckman) or an interim whose promotion to permanent head coach seemed like little more than a stopgap (Bill Cubit). Smith’s presence—as well as that of new athletic director Josh Whitman—offers hope in the form of a clean break from a lamentable period of Illini football defined by accusations of player abuse and kickoff-time photos of a mostly empty Memorial Stadium. Smith’s hire has already helped with the latter. Illinois said in a news release last week that it sold 2,000 new season tickets in 48 hours. That enthusiasm should bear fruit on the recruiting trail. More importantly, Smith will resonate with the families of local players who watched him lead the Bears to the Super Bowl in 2007 in addition to four double-digit win seasons. And hiring proven recruiters to his staff would help. Even if Illinois isn’t able to keep the state’s top talent away from the likes of Ohio State and Notre Dame, Smith could provide the Illini more legitimacy in battles for elite prospects. Yes, Smith has a Twitter account now, but the opportunity to play for a coach with years of NFL experience is a stronger pitch than anything he can disseminate on social media. As is always the crux in recruiting, Smith will need Illinois to start winning more games before he can hope to make major gains on Signing Day. Prospects could be more open to the idea of joining Illinois because of Smith, but a lack of on-field progress will undermine his ability to convince them to spend four years in Champaign instead of, say, East Lansing or Columbus or Ann Arbor. It helps that the Illini are in the Big Ten West, the weaker of the conference’s two divisions, meaning they won’t have to face Michigan State, Michigan and Ohio State every year. Smith may also be able to coax better performance from lesser players than previous Illinois coaches could. That’s a short term-bonus, though. For Illinois to succeed in the long-term, it needs better players. Four-star cornerback Tre Swilling is drowning in recruiting mail. • Athlete Demetris Robertson signed a financial aid form with Cal, Scout.com affiliate BearTerritory confirmed last week. What does that mean? It mandates that the Golden Bears honor Robertson’s scholarship and permits them to have unlimited contact with him. However, it does not mean that Robertson has committed to the program, nor is it the same thing as signing a National Letter of Intent. Robertson’s recruitment is not over. In fact, the Atlanta Journal-Constitution reported that Robertson has signed the same form with Georgia Tech. The lone unsigned five-star prospect in the class of 2016, according to Scout.com, Robertson has taken official visits to Alabama, Georgia Tech, Notre Dame and Cal and plans to see Georgia later this month. Stanford reportedly remains a factor in his recruitment, too. • ACC defensive coordinators based outside of Tallahassee, Fla., received some bad news last week. James Cook, the brother of current Florida State star Dalvin Cook, announced he has committed to the Seminoles. A rising sophomore, Cook is a member of the class of 2019, so he won’t be able to sign his NLI for three years. Still, if he sticks to his pledge, it’s not unreasonable to think he could have a similar impact to his older brother’s. James Cook reportedly has drawn scholarship offers from the likes of Alabama, LSU and Ohio State, and he rushed for 709 yards and eight touchdowns at Miami Central (Fla.) High last season, according to the Orlando Sentinel. As if Cook’s looming addition wasn’t enough for the aforementioned DCs to worry about, here are the other running back recruits set to join Florida State in the three recruiting classes before Cook arrives: 2016 four-star Amir Rasul, 2017 four-star Zaquandre White and 2018 prospect Charles Strong. • There is no mystery surrounding the school to which running back Najee Harris is committed (Alabama). There is a lot of uncertainty over whether he’ll actually sign with the Crimson Tide. Harris, the top overall prospect in the class of 2017, according to Scout.com, told Scout last week that he visited UCLA and USC and that he plans to take a trip to Ohio State next month. In addition, the Antioch (Calif.) High standout said last month that he remains “open to everybody,” according to Scout.com affiliate GoldenStatePreps. Harris, who pledged to Alabama last April, is one of two running back prospects in the class of 2017 committed to the Crimson Tide, along with four-star Brian Robinson. Alabama watched another four-star running back in the class of 2017, Cam Akers, renounce his commitment earlier this month.